Hello Downtown Boulder, It's Emma! 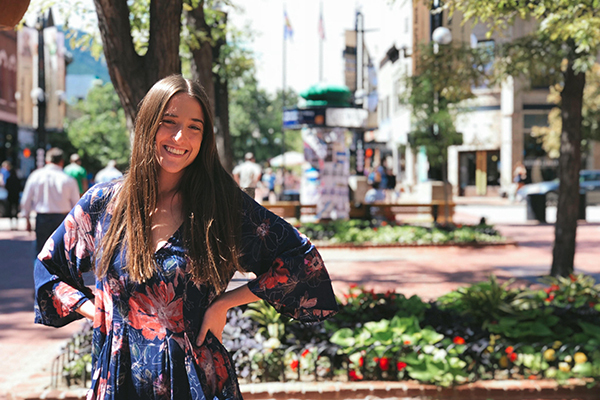 My name is Emma and I am the new Downtown Boulder Intern for Fall 2018. I am currently entering my junior year at CU Boulder where I am studying Advertising and double-minoring in Business and Communication. As a Boulder native, when the time to choose colleges came around I realized I couldn't’t leave Boulder because it was well...perfect. Since committing to CU almost three years ago I am still in love with this town and happy I decided to stay. As I am entering my final years of college I am excited to be interning at Downtown Boulder and getting to not only grow as a professional but also immerse myself in one of my favorite places to be in Boulder...downtown! As a Boulder native I am excited to share my expertise about all things downtown as I have been coming to Pearl Street and the surrounding area since before I can remember. Growing up in Boulder I have always cherished the energy and vibe of downtown, it is so unique and eclectic. The street performers, locally-owned shops and amazing restaurants all add to the breathtaking ambiance of the outdoor mall. I love sleepy mornings on the mall more than anything, right before the shops open, taking a nice slow stroll to start the morning off with coffee in hand, I love looking at the sun soaked trees and brick buildings. After the shops and restaurants begin to open there is an energetic buzz surrounding downtown, the sound of bikes, the smell of food and the chattering of people walking around are all familiar, almost comforting sounds to me. Having the Flatirons as a backdrop only adds to the magical feeling of strolling down Pearl Street. During my internship with Downtown Boulder I hope to gain insight into the inner workings of this vibrant community, find new places downtown that I did not previously know about, and get exposed to new knowledge in my field of study. I am also excited to be working with an amazing, experienced team who I am sure will be able to teach me so much. I can’t wait to kick off my year with Downtown Boulder!